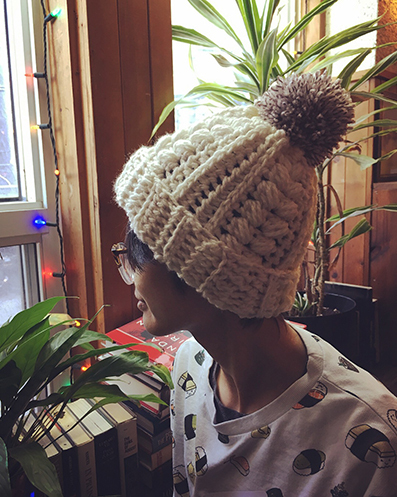 1) The hat is quick to make. 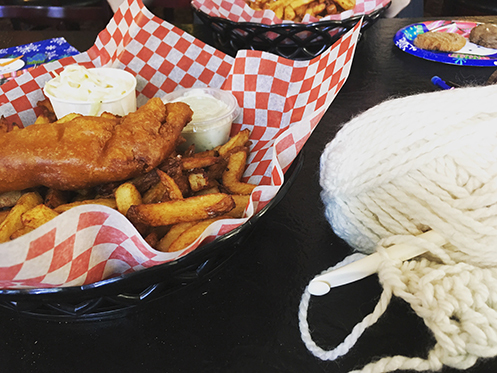 I had to restart several times while I was figuring out a pattern, and I was also eating a very delicious plate of fish and chips (AWAY from the yarn — this setup was only for Instagram! 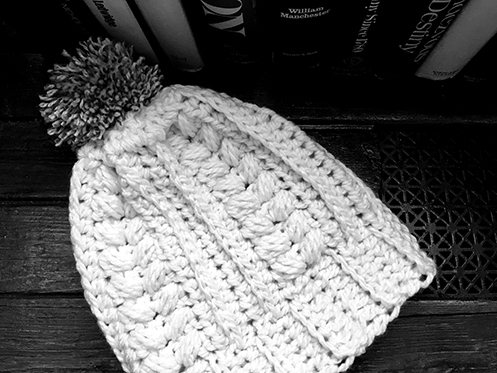 ), but I made the hat from start to finish within 4 hours, so making it from the pattern should take much less time! 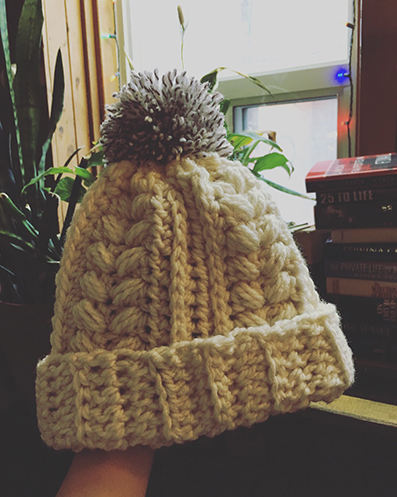 2) Since it’s such a quick make, I’m hoping that this will encourage you to make one for yourself and make another to pass it on to someone who can really use a thick and warm hat! 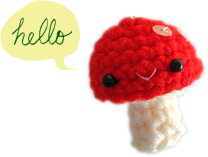 The hat measures about 9″ tall (brim folded) and 20″ around. 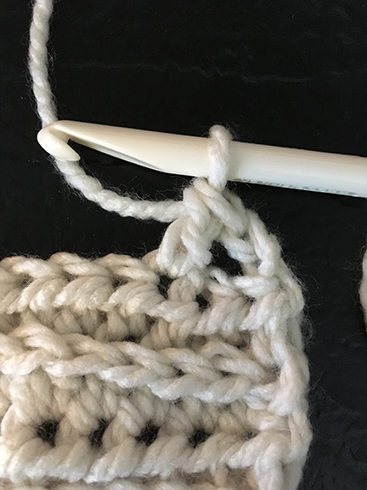 Contrasting colour yarn for pom pom. 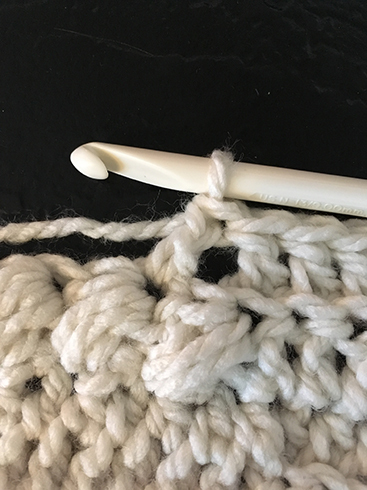 9 mm hook, and a smaller hook for weaving in ends. 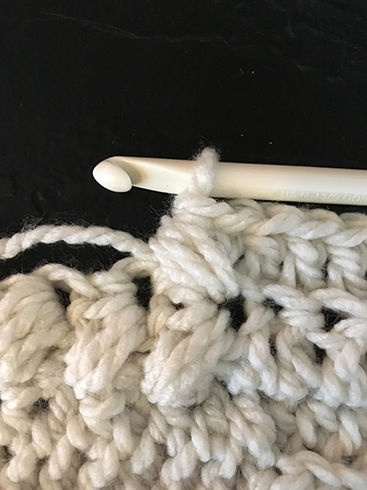 *Note: beginning ch does not count as a stitch throughout the pattern. *skip next hdc, dc in next hdc, puff st in the same hdc as last dc made* rep from * to * till there are 7 hdc’s left in row, dc BLO in each hdc to end. Then end with a puff st.
Then hdc in next 17 st’s, hdc BLO in last 6 st’s. Row 6: ch 1, hdc BLO in first 6 hdc’s, hdc in the 3rd loop in the remaining 18 hdc’s. Row 7: ch 1, hdc in first 18 hdc’s, hdc BLO in remaining 6 hdc’s. 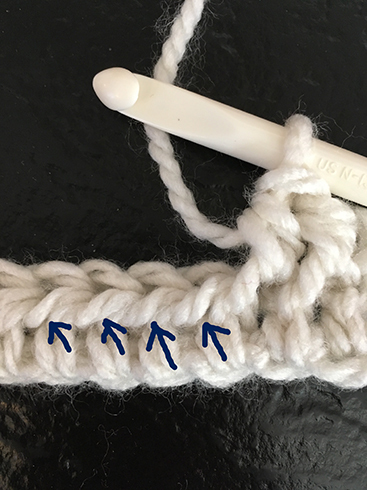 Repeat rows 2–7 three more times, except in the last repeat, omit row 7 and end with row 6. Decrease row at top: ch 1, 2 dc tog evenly across the top of the hat. 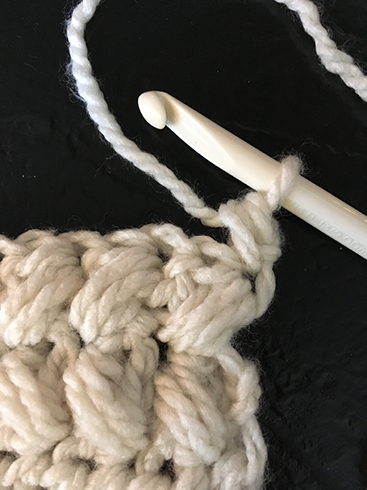 Cut yarn and leave a long tail for sewing. Thread yarn tail in yarn needle, weave yarn tail through the stitches at the top of hat, cinch close and tie to secure. Turn hat inside out, sew seam. 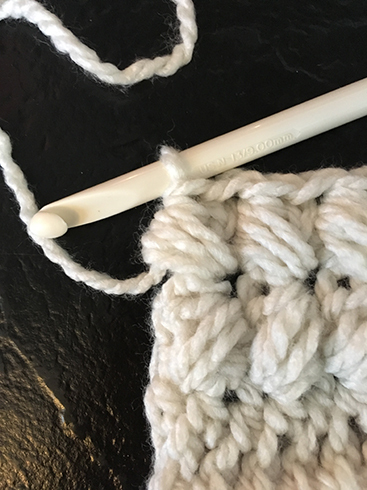 Make and attach pom pom. 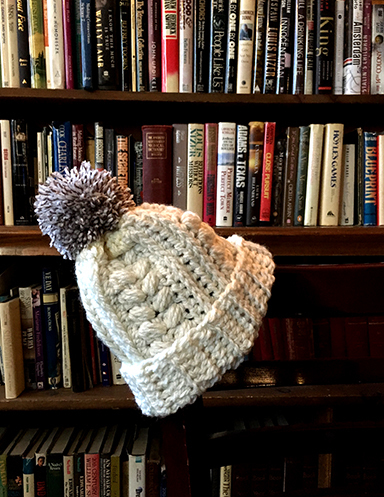 Fold up the brim for extra warmth! 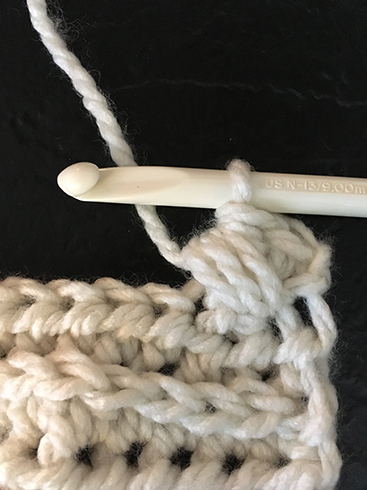 Here’s a list by the Toronto Knitters Guild of places that accept yarn‐crafted goodness in Toronto. 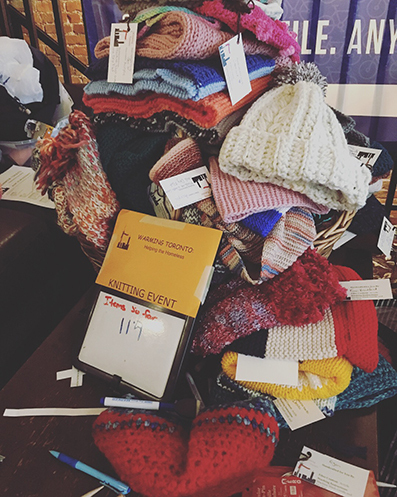 Warm Hands Network collects and sends handmade items nationally and internationally, especially to northern locations. 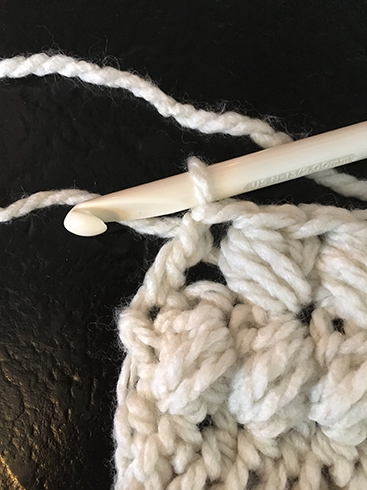 With glowing heart and busy hands — happy yarn‐crafting!